What it’s about: That time that ferns completely upended all life on Earth. Azolla is a freshwater fern often used as fertilizer in rice paddies, but 49 million years ago, it spread so far, and absorbed so much atmospheric carbon dioxide, it drastically changed the Earth’s climate, from being so hot that palm trees grew in the Arctic, to the current, relatively cool climate we’re in the middle of screwing up. Biggest controversy: Though azolla are freshwater plants, the “azolla event” took place in the Arctic Ocean. Two theories explain this discrepancy—one is that the Arctic was cut off from the other oceans (49 million years ago, the continents were midway between Pangaea and their modern arrangement, so the northern landmasses were all connected), and was fed largely by rivers and rainfall, giving it a freshwater layer on top of denser saltwater. The other theory is that the azolla plants grew in freshwater and were swept downstream into the ocean. Strangest fact: Azolla were the Tribbles of the Eocene era. In the right conditions—namely 20 hours a day of sunlight and moderately warm weather—it can double in size in two or three days. Those requirements might seem unreasonable now, but in the Earth’s greenhouse days, the poles were moderately warm, and then as now, had 20-hour days for part of the year. The result was a whole lot of azolla. Enough to cover the 4 million square kilometers of the Arctic basin. Thing we were happiest to learn: Just letting a bunch of azolla grow isn’t enough to drastically change the climate. It took a lucky (or unlucky, if you thrived in an Eocene-era climate) sequence of events for azolla to have an impact. While azolla are particularly good at soaking up carbon dioxide, drawing down six tons of the gas per acre, plants ordinarily die and decompose, releasing their stored CO2 back into the atmosphere. But as well as the freshwater layer theorized above, the Arctic Ocean had an anoxic—or oxygen-deprived—layer at its deepest point. 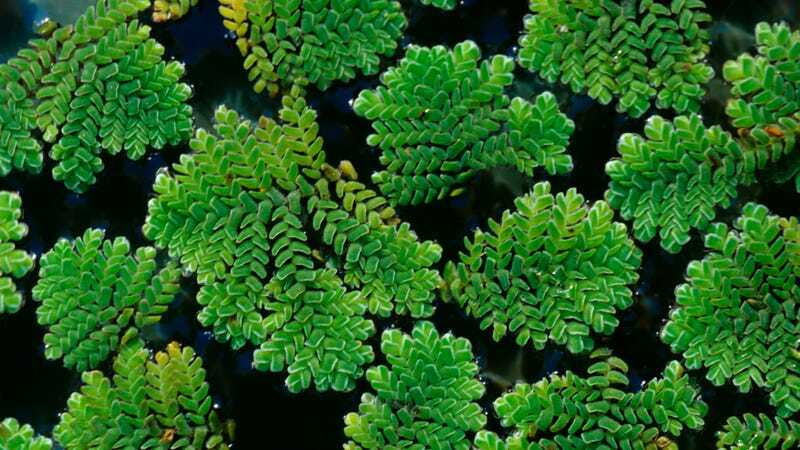 Which meant azolla blooms that grew in the freshwater layer would eventually sink to the anoxic layer, where they didn’t decompose, keeping their stored CO2 buried under the sea. As such, the blooms were able to absorb and store roughly 80 percent of atmospheric CO2 over the course of the 800,000 years they ruled the Arctic. Thing we were unhappiest to learn: Azolla may end up changing the climate again. Companies are eager to drill in the Arctic in the hopes of discovering that the azolla blooms’ remains have long since turned to oil or natural gas, although at present there’s no evidence either way. Burning whatever fossil fuel the azolla produced would put that sequestered CO2 right back into the atmosphere, putting us a step or two closer to returning to the good old days, when palm trees flourished at the North Pole. Mammoths roamed the Earth in the early ice age. Best link to elsewhere on Wikipedia: The azolla event transformed the world from greenhouse Earth to icehouse Earth. Over a span of geologic time, the planet has alternated between those two states, with the shift from one to the other causing massive upheaval for most living things. Greenhouse earth is loosely defined as a period with no glaciers whatsoever, as a result of high temperatures corresponding to high atmospheric CO2. Icehouse earth covers any period where the poles are covered in ice, and can include glacial periods like ice ages and “interglacial” periods like the present. Further down the Wormhole: The azolla event brought global climate steadily down from its peak over the last 55 million years, the Paleocene-Eocene Thermal Maximum. Just a warning, the PETM was caused by an increase of 0.2 metric gigatons of atmospheric carbon per year over 20,000 years. We’re presently putting 500 times that much carbon into the atmosphere, so only 40 years of pollution would have the same effect—namely a 200,000-year-long warm period. Manmade climate change is being addressed on several fronts, one of which is carbon-neutral fuel. This includes renewable energy like solar, wind, and hydro, and even recycling carbon emissions as fuel. The latter is a technology still being developed, and one far more realistic than another emerging technology, the head transplant. We’ll see what real-life Dr. Frankensteins have been up to next week.